Check Us Out on Amazon and Etsy! 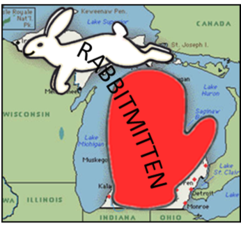 Home / What is Rabbitmitten? Everybody knows about the Michigan “mitten” but Michigan is made of TWO pieces! The “mitten” is just the lower half -- the lower peninsula! 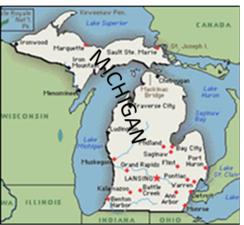 The "mitten state"? That’s not fair! What about the Upper Peninsula -- the “U.P.”? Have you ever seen the rabbit jumping over the mitten? and I’m sure you’ll see it!